The Southern Maine Partnership (SMP) is a school-university collaboration that has linked schools and university in support of student learners since 1985. The Partnership has grown from a group of six school districts to a membership of 36 school districts, 2 private schools, and USM. Our membership represents over one-third of the public school students and teachers in the state and the major teacher education and leadership development university in the region. The Southern Maine Partnership strives to support the development of schools that fulfill the promise of public education through promoting equity for all learners now and in the future. The Partnership has national ties as well as serves as a regional center of the Coalition of Essential Schools (CES) and a member of the National Education Association (NEA). Current work centers on issues of equity, rigor, and personalization in classrooms, schools , and communities. Through networking, applied assistance, and research and dissemination, the SMP assists schools in fulfilling the promise of public education: to educate all students well and to prepare them for futures of promise. 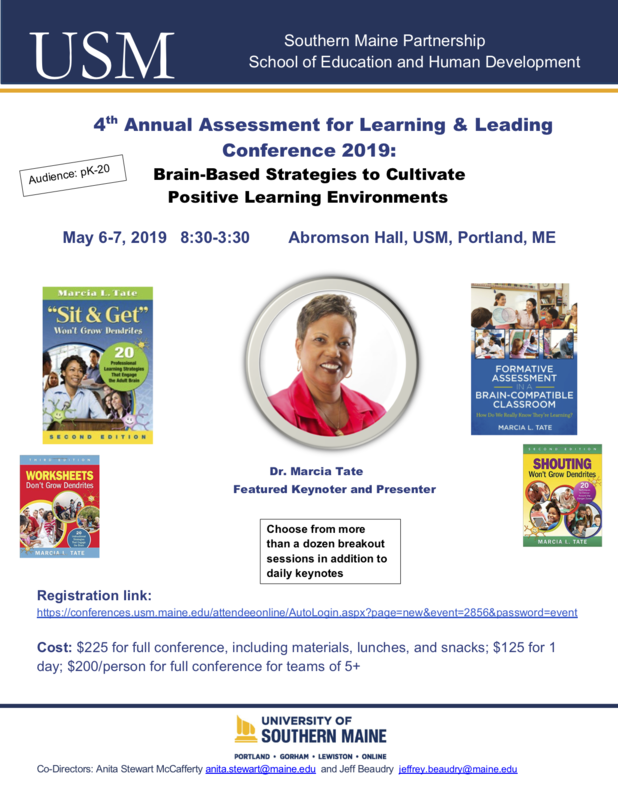 Join us for two full days of learning at our 4th Annual Assessment for Learning and Leading Conference! This year’s theme is Brain-based Strategies to Cultivate a Positive Learning Environment! Dr. Marcia Tate, renowned author, educator, and consultant, will be our featured keynoter and presenter each day. In addition, a host of educational leaders from Maine will share their most promising assessment and teaching strategies and structures. The conference is designed for the pK-20 audience and will feature daily keynotes, breakout sessions, panel discussions, and opportunities to network and share ideas to enhance teaching, learning, and assessment practices in the pK-12 and higher ed classroom.